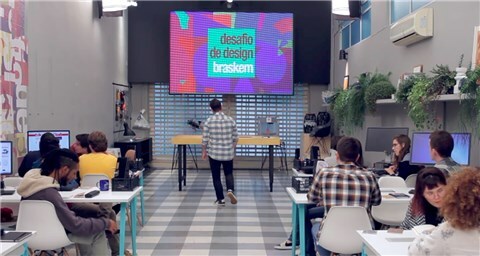 A big hit on YouTube last year, the reality show showcasing the daily lives of 18 architecture and design students selected for the Braskem Design Challenge is back. The first episode of this season is already available on Paulo Biacchi’s YouTube channel. In total, 10 chapters will be showcasing each student’s creative process and stories in the development of an injected plastic product. In this 6th edition of the Braskem Design Challenge, in partnership with Paulo Biacchi’s Fetiche Design, students from the FAAP, IED, Instituto Mauá, Mackenzie, São Judas and USP universities are given immersion activities and training under the mentorship of Biacchi himself , as well as designers Marcos Worms and Nicole Tomazi, and with training of other professionals in the area to develop a new solution for the domestic appliance market. To follow the competition, which features new episodes every Thursday at 9 pm, just sign up on the channel www.youtube.com/desafiodedesignbraskem or follow Paulo Biacchi’s channel. The Design Challenge was created with the aim of presenting plastic to future architects and designers as a versatile and adaptable material, which makes it possible to solve problems and opens the way to new professional opportunities. In its sixth edition, the program’s priority is to provide students with a market development experience, while fostering a new mindset and new paradigms regarding the use of plastic.